This is an unabridged reading – by Adric himself, Matthew Waterhouse – of Terrance Dicks’s 1983 novelisation of the 1982 Fifth Doctor serial by Terence Dudley. It takes Waterhouse just under three hours to complete the task, because this is one of Uncle Terrance’s more basic prose adaptations. Dicks appears not to be aware that Nyssa’s home planet Traken has been destroyed. He also claims that the TARDIS crew have been travelling together for more than just the couple of stories they had experienced on screen by this point. Since boarding the TARDIS, Tegan has “been carried through a series of bewildering and terrifying adventures, demanding stridently all the time to be taken back to Earth”, and she has witnessed the ship’s take-off sequence “many times”. This assertion has since come true, as new prose and audio adventures have subsequently been slotted into place prior to Four to Doomsday. In other respects, though, the novelist doesn’t deviate much from Dudley’s scripts. The narrator also breathes life into the dialogue, doing a good, breathless impersonation of Peter Davison’s Doctor. He also appears to have done his research regarding the guest cast, giving us a suitably sombre Bigon and a guttural Monarch – matching both the textual description of the Urbankan’s voice as “croaky” and the vocal delivery of Stratford Johns, the actor who played him on screen. Waterhouse’s Lin Futu is less successful, coming across more in the way of a stereotypical, high-pitched “ah, so” kind of voice than the deep tones of Burt Kwouk. Just occasionally, the narrator pitches his voice too low and it is hard to catch certain phrases. For instance, the word “Monarch” is all but lost in his reading of the chapter title “A Meeting with Monarch”, so listeners may be confused if they don’t already know who Monarch is – which, admittedly, is unlikely. The printed book’s original cover was an uninspiring photo montage of Monarch and the Doctor (which is shown in miniature within the CD jewel case). 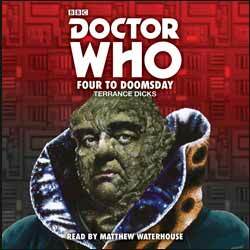 This audio release makes use of the main image from Alister Pearson’s illustration for the 1991 reprint (which curiously isn’t shown inside the CD case), with a new red background, which provides a better contrast than the previous green while also subtly referencing the colour scheme of the 1983 cover. This novelisation is never going to win any literary awards. However, thanks largely to Waterhouse’s reading, Four to Doomsday kills three (not necessarily to doomsday) hours rather effectively.